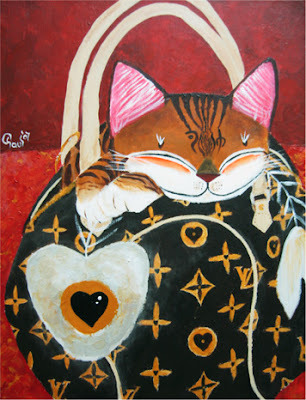 Love & Valor, the latest catmasutra painting, is a little parody on the luxury brand that people seem to aspire to. HAHA It came as a surprise for me when several friends mentioned that they would rather own a LV bag than travel! You will always have the LV bag whereas once your vacation is over, it's over! And I said, what about memories?!! When you think back, you will not remember the money spent, but you will always treasure the memories and the experience of going to a new place. I guess, they will always have their LV bags. Well, no chance of them buying this painting;)! Love is - for the things that drives you. Valor is - for the courage to take on your dreams and make them real. I'm not talking about luxury brands here (although the aim of good brands is to layer real-life aspirations on their products and hence the deception- remember the devil wears Prada!). 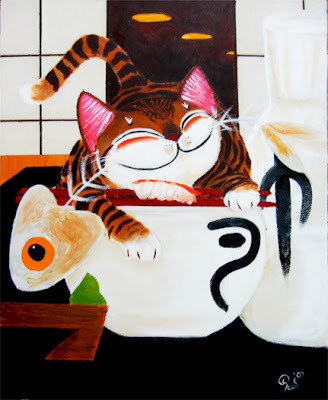 I'm talking about owning and taking a catmasutra painting home wahahahaha kidding! I'm talking about finding that spark inside that really drives you, and then actualizing that spark come what may. Yep, it's more easily said than done. Catmasutra didn't make it for the second day of the Arts Fair. The weather was bad, and it wasn't really the place to showcase original art work. Also, I suspect the appreciation of art in Singapore, in general, is nowhere at the street level. There is a lack of buzz, excitement about art. It's more like a fair for T-shirts, beads, hand-made crafts, etc; it's more like street shopping! Singapore has, at one time or another, aimed to be a hub for all things, but the most challenging one, I supposed is to brand itself as an arts hub. It is not. Even without the Esplanade, or the Singapore Biennale; or if the same amount of money or just plain old belief is invested in Singaporean artists themselves by the powers that be, we would be an arts hub. The belief today, as it was before, is that you have to go abroad to make it as an artist. 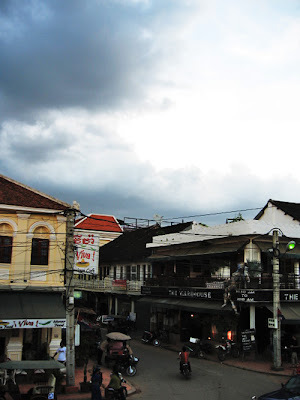 Once you've succeeded overseas, you can then come home and thrive as an artist. We tend to celebrate the local foreign artist first, without accepting the likelihood that these people left our shores because Singapore limits their potential in the first place. Until the time when we really understand the intrinsic value of art, feel it in our bones, and feel the need to be touched by it; until the time when creativity and freedom of expression can co-exist and not deemed as antagonistic to "peace and harmony", then there will be a buzz. Art in its most basic form, pushes boundaries, makes us see things in a different light, creates a little chaos so that we can re-order our mindscape and grow. These things rank low in the Singaporean mentality. The art of petting is the affectionate act of stroking, brushing or caressing an animal's fur, scratching its ears, rubbing its belly etc., for mutual enjoyment. Grooming behavior in some animals is similar to petting, but generally the verb "pet" refers to a human petting a cat or - rated NC-16 and in more extreme cases, rated R(A) - petting another human being. Different ________ respond well to different types of petting, even within the same ____ . One may enjoy a light scratch, just between the ______, while another may demand to be kneaded like a loaf of bread. A ______ might like to be brushed, a ______ may prefer a _________ rubbed in circles, whilst ______can enjoy having the tops of their heads gently scratched, against the grain of their ______! Finally, the catmasutra signboard! I didn't want to be precise but just drew the words free-hand onto the canvas. I like the imperfections as that has always been part of Catmasutra - finding every nook and crevice for the rough and tumble catmasutra cats to appear with their ear-to-ear grins - that in spite of life's imperfections, there is always a positive side, good enough for a smile any time! 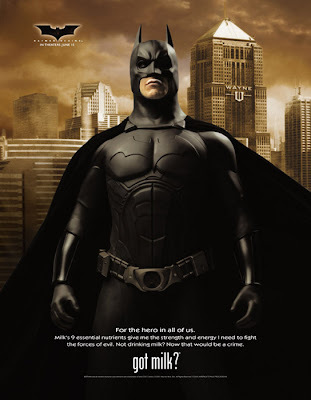 It's almost like V for Vendetta (love that graphic novel and the movie ain't too bad either), the mask taking on an immense symbolic value. "People should not be afraid of their governments. Governments should be afraid of their people" or in typical catmasutra fashion, "People should not be afraid of their lives. Their lives are there for the living!" Easy for the cats to say - they have 9 lives! wahahaah. Maybe we should live as if we have 9 lives - live it for what it's worth! 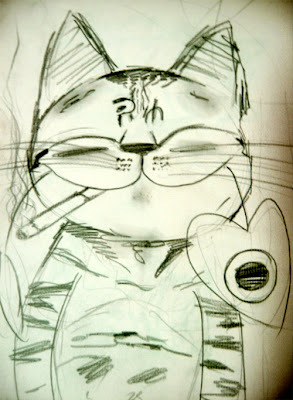 For catmasutra paintings, I sketch directly on the canvas; the circles are imperfect circles... lines are often not straight. Sometimes there's lot of improvising during the painting process but these imperfections are part of the beauty. Nowadays, with computers and projectors, you can do most things accurately (and I'm a designer myself...) . A case in point was an artist I met whom I've heard has decided to go into prints rather than paint on canvas! The line has indeed blurred haha! But I love paints, and the process of painting. Prints can never compare to the original artwork. The way light "react" to acrylic on canvas is different from the way it reacts to prints, even those on canvas! Here's a heart warming story about a cat's second life - Snowy, a street cat got hit by a car, and in all accounts would surely be left for dead. Some people would just scream when a street cat brushes past their legs - what hope is there for a hit-and-run case for a street cat? Then there are people like Celeste, who will rush the cat to the vet, and does all that can be done for it, and more... Incredibly, Snowy is getting better albeit very slowly. If you want to help whether financially or find a home for Snowy, check out Celeste Lock's blog. Been busy, busy, busy... preparing for the Culture by the Bay Arts Fair. It's this Saturday and Sunday from 11am to 6pm at the Asian Civilizations Museum grounds. I was thinking how to display the Catmasutra paintings and prints in an open booth with no walls or pillars except 1 table and 2 chairs...!??? I went searching everywhere and bought some stuff to improvise, and I think I'll probably have to bring my 2 very well-worn and paint-stained easels as well. Then what about a banner or a signboard? I was considering different options - print a banner at Bras Brasah, or just paint the words on a board or something... then came a big IDEA! 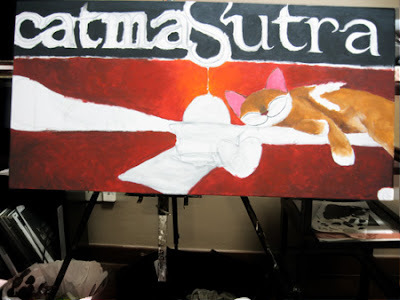 Paint another Catmasutra painting with a signboard in it wahahaha! Once I decided on this, I needed a concept ... and since the fair is out in the open, I thought I'll paint something "cooling" like an old-fashioned ceiling fan haha . 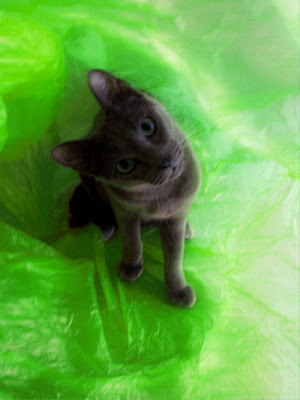 Of course, the Catmasutra cat Halo would be the first to take advantage of this... by sleeping on it! So it will be an elevated view looking directly at the signboard - the traditional one with black wood and golden lettering (which I like) - and behind the board is the main hall and the ceiling fan and of course, the cat haha! 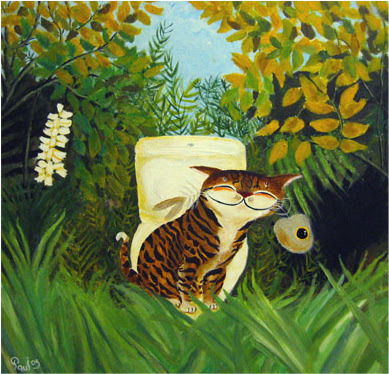 I'll probably put this on the easel so that nobody misses the Catmasutra booth! 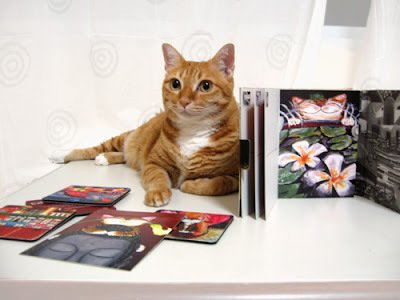 Also, I have stuff like postcards and coasters, mainly from the Catmasutra II and a few from the first Catmasutra exhibition. My place is actually filling up with paintings now and it's bright and cheerful - imagine catmasutra paintings hanging from wall to wall everywhere you turn;) Honestly, it's a bitter sweet feeling when the paintings get sold. It's fantastic, of course, that people appreciate your work and buy them - that really encourages you and sustains you as an artist; the sad part is of course, when they get sold, you're really selling something that you have become very attached to. Maybe prints is the solution to solving some of the heartache although nothing beats the original, haha. I have passed some of my newer works and borrowed a few that my friends bought (so nice to see the originals again, tks guys!) to Art Prints Asia and this guy put them through hi-res scanning and viola! catmasutra art prints! I asked him to give a discount for the Culture by the Bay Arts Fair, and it's better than I hoped for! He's giving a discount and a free upsize!! So if you buy A4, you get A3 and so on... Gotta sleep zzzZZZZ Hope to see you at the fair!! 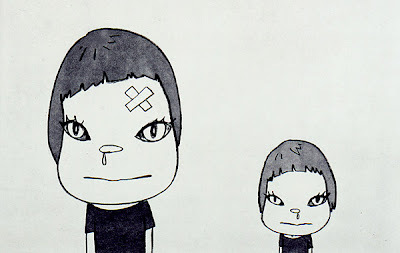 There's something about Nara Yoshitomo's paintings and Haruki Murakami books that got me hooked. Maybe it's that oddness, the feeling of not really belonging anywhere and that nothing is at all what it seems... If you dig deeper, walk between the raindrops, you can find something else in between. Only you can find what's hidden from you but first, you must start looking. There's this flow of energy that vibrates in between, that blurs the line between reality and myth, between the power of everyday and the power of imagination. 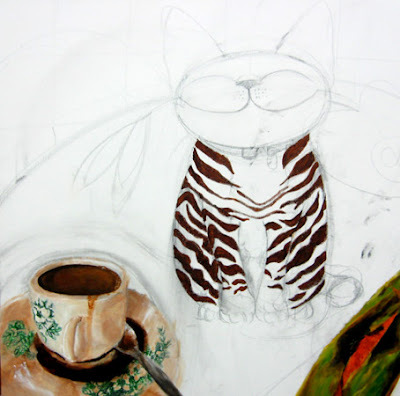 Catmasutra paintings are part of this in-between world. The irrepressible wide grin of the cats is representative of that energy. haha it's a good place to be in when everyday realities take a toll on us... 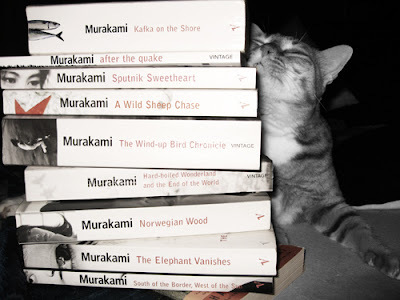 Moral of the story, when you have a running nose or a headache from everyday life - take a break, read a good book, be like the catmasutra cats - there's always a smile for everything! Trying something a little different here, perhaps something on the side to go in parallel with the catmasutra series. 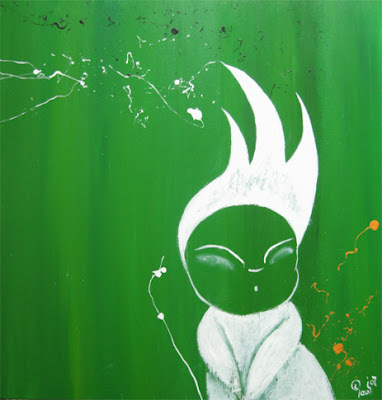 This piece is called "Green Peace". It exhibits the child in us, tied inextricably to nature and feeling the abuse inflicted on our environment. It's as if as we grow older, we drift further and further away from nature... It's a fun, relaxing piece plus a little "green" reminder, fusing together my abstract and illustrative styles. The former is something I experimented with quite extensively a few years back culminating in a paulMysh exhibition done in 2004 . The abstract component is very instinctive and spontaneous and is quite a liberating experience. Of course, if it goes wrong, it goes horribly so. 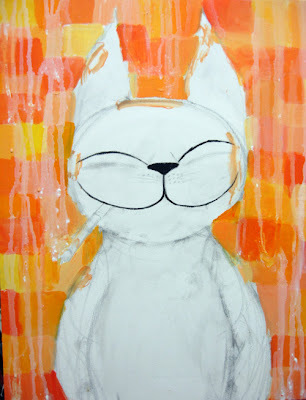 Through the Catmasutra series, I have become more inclined towards the story-making of a painting; it has the power and irreverence to connect immediately as opposed to much of the pretenses that seem to plague the sanctity of high-priced art. 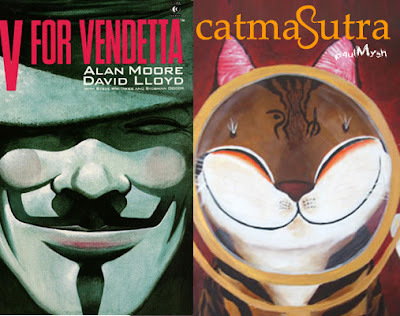 Catmasutra tells a happy story and that the consumption of art should be as necessary as bread. It takes things from all around us and presents a moment in a story that is personal and yet universal (like a quiet moment in the washroom, wahahaha). 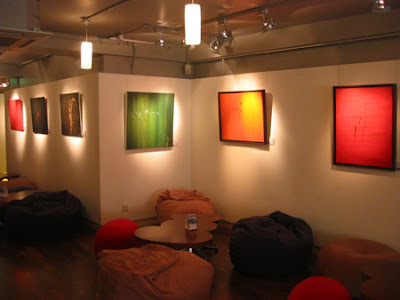 I remember one gallery owner telling me that my art (catmasutra) is not really "proper" art and implies that it would be that much more difficult to move up in the art world. ..
We all need a kick in the nose sometimes... just to get the air circulating again. Sometimes, you feel so clogged up that you just wanna lie in bed and stay there, the perfect inertia. Time passes but everything else remains the same - and we'll remain exactly where we are in the same position day after day. Can you imagine fast-rewinding our days and see ourselves repeating ourselves over and over again? Worse, can you imagine fast-forwarding and seeing yourself being photocopied over and over again, becoming more of a carbon-copy each time? 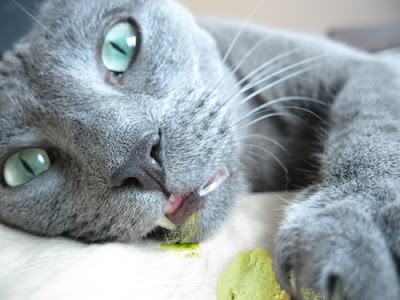 If you can, then it's time for that jolt out of our stupor - wasabi! What you need time and again is a dash of catmasutra-inspired, nuclear-powered horse radish that would potentially shoot up and fry your mind if you do not consciously breathe. Yes - breathe and the air may be a little different from yesterday. There are many gurus nowadays, telling you how the universe will open up for you or conspire to make your dreams come true, if only you attend their seminar or buy their books. Truth is, what we really lack is discipline. It's easy to get inspired. It's sustaining it that matters! I read this somewhere and I thought it makes sense - If you have a talent, you must pursue it. There's no two way about it. It's about preserving your soul, it is that extra something that will keep you inspired, that extra wasabi to keep you disciplined. It follows that it is not okay to stay where you are and be contented with it especially when you realize you're becoming too comfortable. First, you have to find what that desire is. Of course, too much wasabi will just fry your brain! 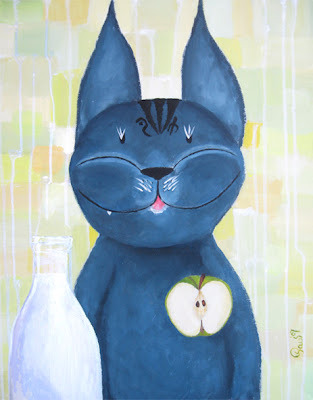 New quirky Catmasutra paintings - Got milk? Got light? 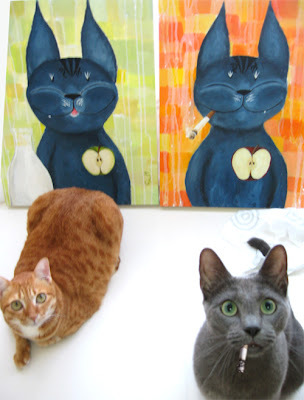 Come meet face to face with Halo and Angel, the inspiration for both Catmasutra paintings, "Got Milk?" and "Got Light?". 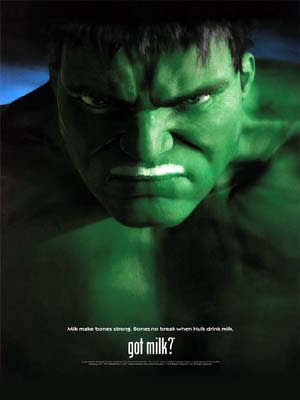 The inherent dark and light in everyone - the fine line between temptation and milk. So where do you draw the line? Well, it's probably defined by the choices we make that take us from one direction to another. Back and forth we go, we can make wrong turns, but it doesn't matter as long as we have a good internal map. With a good map, we can always find our way back again. What is your map about? Catmasutra will be at Culture By The Bay Arts Fair! Hop over to the Asian Civilisations Museum grounds and soak in the creative atmosphere at the two-day Arts Fair. 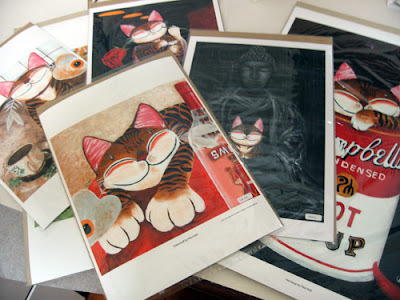 Go home with a rare find or two, especially Catmasutra paintings and limited merchandise!! Take a sneak peak on what's coming up for Catmasutra IV, and I'm trying to get some high quality prints of past works for the event as well. Remember the "art of rebellion" concept? Haha, finally doing the painting. Some changes though... Smoking is not very "happening" nowadays - maybe it's a good thing. 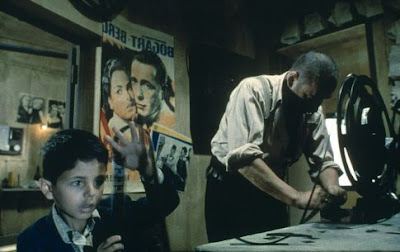 Sometimes, it seems smokers are like outcasts or criminals - that's how I always tease my designer - confined to some small forsaken "yellow" corner, like naughty children having to stand outside of the classroom as punishment. Maybe the power that be should just ban smoking just as they did chewing gum. After all, what's worse? Chewing gun that affects the running of our subway trains (it is now folklore that this was the main reason for the ban) or smoking cigarettes? Of course, that's just bad business, with a stick costing more than 50 cents. I'm calling this piece "Got light? ", and instead of painting Halo, it'll be Angel instead. After all, he's an angel and light is his main resource haha. Angel is a rascal of a cat but he has enough light and humor to see him through. So with him, I can be more experimental! Anyway, this will be his last stick. He's quitting. I'm probably gonna add a big fat apple floating somewhere representing forbidden pleasures. Symbolically, this is about weighing the odds between momentary pleasure and true happiness. The shoe salesman says "Did you want to try these on?" The woman who drives the cab says, "No, I'm just driving him." - So those are comfortable? -- I guess so. I mean, they kind of rub my ankles, but all shoes do that. I have low ankles. --I don't think I deserve it. - Well, not consciously maybe. -- My ankles are just low. - People think foot pain is a fact of life... but life is actually better than that. There is one sky. I love the sky especially during the evening time. If you have a place that you can look out of, or for that matter, just a window, remember to catch a piece of the sky and hold it for a while. It's like the world is one big house, and there is really just one sky, and the only difference is that you're looking at it from a different window. Zoom in, and here I am, on a small island, in a small place, with 2 cats, looking out at the same sky as you are. It's such a nice big picture that you can't help but feel this is no longer such a small place, that somehow there's more room in the world now (places and things get smaller and smaller when you keep doing and seeing the same things over and over again), and there is more magic out here than we care to let ourselves believe. Can you keep your balance? Internally, externally? What is the weight at the opposite end that will keep you at where you are? What happens when something tips the balance? Desire? Jealousy? Greed? Obsession? Watch this clip called "Balance" which won the the Oscar for Best Animated Short, 1990 and deservingly so! Another new piece based on the coffee shop theme. This is what I call coffee! I prefer the authentic local coffee brew, when done properly, tastes as good as any of those served by western coffee chains as Starbucks, TCC or Coffee Bean. 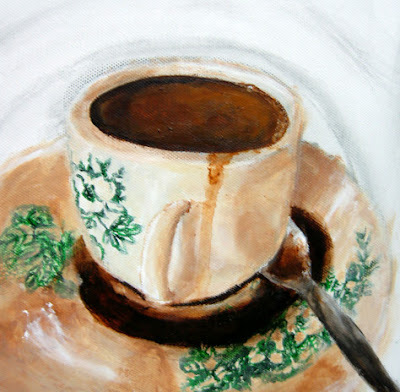 I don't mind the latter but on a daily basis - give me that good old kopi-0 any day (also its much more economical). Some foreign workers (from the Western continents) may decry the quality of local coffee, so much so that in their minds, local coffee is just bad coffee. It's just laughable when you hear one such foreign worker shower insults on poor old local and 3-in-1 coffee when the office's espresso coffee machine broke down; how he now has to spend $5 just to get his daily caffeine shot. You know what? Grow up! Heritage, culture, and the joy of the true kopitiam experience! Kopi with charcoal grilled toast served with butter and kaya and soft boiled eggs, and of course you can have otak too. This is especially evident when you're attempting to paint something that is unique to us. 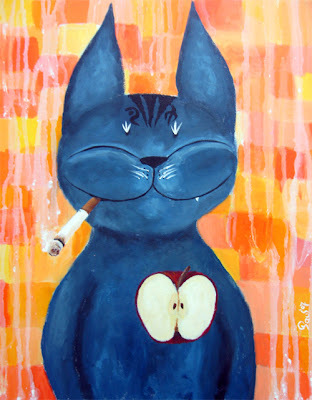 Some of these Catmasutra paintings are a product of this searching. Alas, if we're not going to value what we know is unique to us, then one day they'll become extinct. Shame to all those stall owners who make bad local coffee, especially the food court ones! Finished the remaining details today. Actually illustrated this piece last year but didn't get around to painting it. It was supposed to be "Angel", being a Russian Blue with the Russian Vodka... Changed my mind 'cause I wanted a warm color to complement the red. "Completely original. Completely Catmirnoff!" 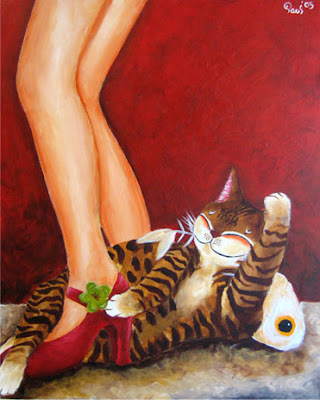 wahahahaha A fun piece, this painting is meant to warm the heart and get you smirking in an jiffy. 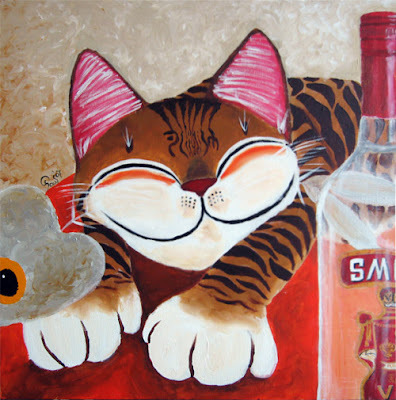 Just add 1/2 - 1 ox 100 proof Smirnoff, filled with Catmasutra-joy juice soda ice cubes. Serve in Highball glass and a high dosage of smirking!